This system consists of a Jointer & Edger, a three-sided Burnisher and a Variable Burnisher, all of which are available separately. Other than a sharpening stone, which all of us will have anyway, Veritas have produced the complete scraping sharpening kit, so now there is no excuse to shy away from scrapers! All the items come with full instructions. 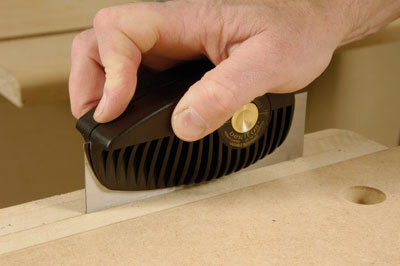 The Jointer & Edger provides a reliable way of removing an old scraper burr or grinding a 45 degree edge. Failing to grind away the old burr is a common cause of irregular edges on a freshly 'sharpened' scraper. This jointer can also be used for jointing saws, if you sharpen your own saws. In practice you place a mill file in the holder and run it along the scraper edge, thereby giving the scraper a true 90 degree edge prior to forming the burr. You can reverse the holder and, using the 45 degree fence, produce a 45 degree angle on a scraper blade. Do not be confused by the fact that one puts a 90 degree edge on a scraper but a 45 degree edge on a scraper blade - a scraper and a scraper blade are of course two separate items. 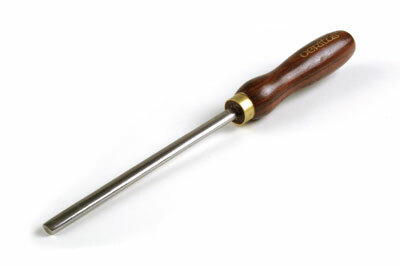 This burnisher (picture above) is hardened to Rockwell 58-60. The three shapes on the one burnishing rod allow all configurations of scrapers to be worked. A burnisher has to be absolutely smooth and polished - this one is and works beautifully. Don't forget the candle grease on the burnisher though. 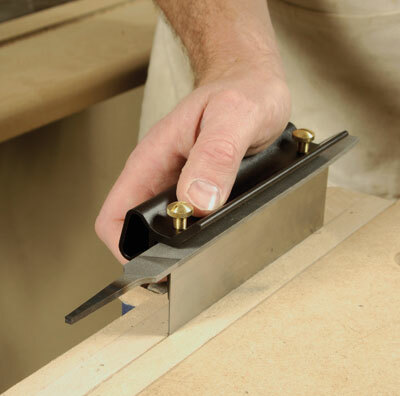 Any method of reducing friction will help to produce a better edge. There is often a lot of discussion in books about 'hook angles'. This little tool lets you produce over and over again any angle between 0 degrees and 15 degrees. Forming the hook and choosing the angle you want often defeats people. So this little guide is an excellent device for introducing those who have been put off using scrapers to the process of forming the cutting edge on straight scrapers. The way it works is that inside the plastic holder is a precision-ground tungsten carbide rod. This is the rod that forms the hook. A brass dial allows the angle of the rod to be changed. Veritas have done all they can to take the complexity out of sharpening scrapers. If you haven't got scrapers in your toolkit then get one of the Variable Burnishers which comes with its own scraper, and have a go. Once you are hooked on scrapers, no pun intended, you will end up using them for final preparation on all difficult timbers. "Veritas have done all they can to take the complexity out of sharpening scrapers"